This example shows that when your data contain a classification variable that groups the data, you can use a plot request of the form y-variable*x-variable=third-variable to generate a separate plot for every value of the classification variable, which in this case is CITY. With this type of request, all plots are drawn on the same graph and a legend is automatically produced that identifies the values of third-variable. The default legend uses the variable name CITY for the legend label and the variable values for the legend value descriptions. This example then modifies the plot request. As shown in the second output display, the plot is enhanced by using different symbol definitions and colors for each plot line, changing axes labels, and scaling the vertical axes differently. Create a format for the month values. Format mmm_fmt formats the numeric month values into three-character month names. Create the data set. 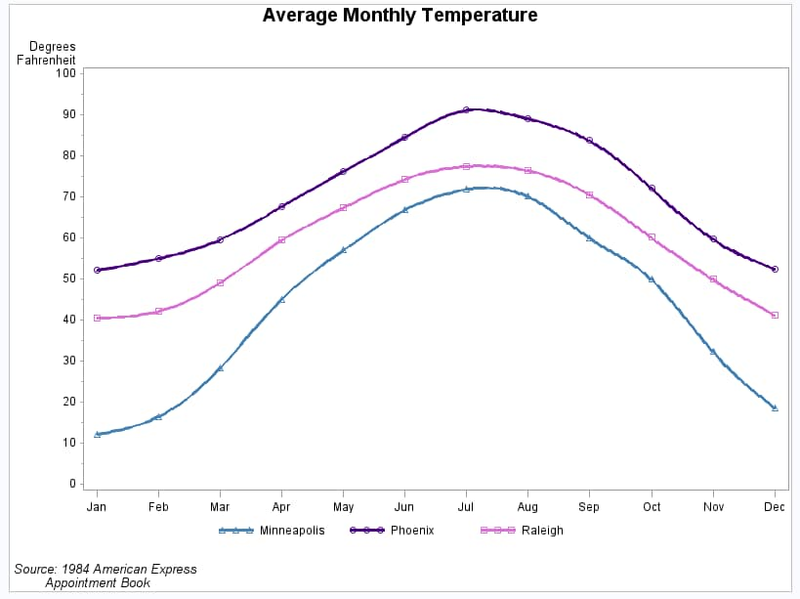 CITYTEMP contains the average monthly temperatures of three cities: Raleigh, Minneapolis, and Phoenix. Define symbol for the first plot. This statement specifies that a straight line connect data point. Because no color is specified, the default color behavior is used and each line is a different color. Generate a plot of three variables that produces a legend. 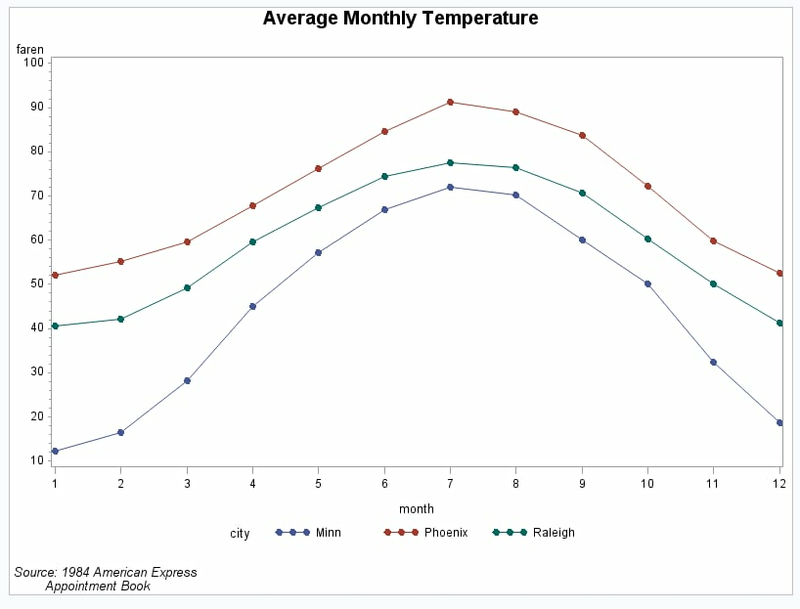 The plot request draws one plot on the graph for each value of CITY and produces a legend that defines CITY values. Define new axis characteristics. AXIS1 suppresses the axis label and specifies month abbreviations for the major tick mark labels. AXIS2 specifies a two-line axis label and scales the axis to show major tick marks at every 10 degrees from 0 to 100 degrees. Format variable month. Format mmm_fmt, which was defined earlier, formats the numeric month values to three-character month names. Generate the enhanced plot. Because the procedure supports RUN-group processing, you do not have to repeat the PROC GPLOT statement to generate the second plot.